Atrial tachyarrhythmias are the most common sustained arrhythmias encountered in clinical practice  and are expressed as atrial fibrillation, atrial flutter, or true atrial tachycardia. The mechanism of most forms of atrial fibrillation is multiple wavelet reentry [2-4] and its electrocardiographic correlates are very rapid (ROSEs>350 beat per minute), irregular in timing, irregular in morphology undulations of the ECG baseline irregularly punctuated by QRS complexes representing ventricular activation after frequency filtration by the AV node. The mechanism of atrial flutter is single-wave macro-reentry [3-5] and its electrocardiographic correlates are rapid (250-350 beat per minute), regular in timing, regular in morphology undulations of the ECG baseline regularly or irregularly punctuated by QRS complexes representing ventricular activation after frequency filtration by the AV node. The mechanism of a true atrial tachycardia is either abnormal automaticity or micro- reentry [6,7] and its electrocardiographic correlates are rapid (100-250 beats per minute), regular or irregular in timing, abnormal p-waves with intervening isoelectric periods regularly or irregularly punctuated by QRS complexes representing ventricular activation after frequency filtration by the AV node. These arrhythmias are facilitated by atrial trauma, stretch, ischemia, epicardial inflammation, hypoxia, acidosis, electrolyte disturbances, and the refractoriness changes that accompany sympathetic nervous system discharge. 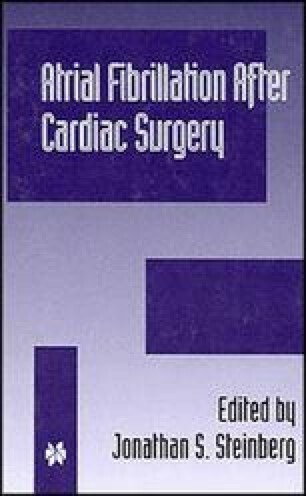 As all of these factors are frequent immediately after cardiac surgery, it is not surprising that atrial tachyarrhythmias are frequent complications of these procedures. Indeed, atrial tachyarrhythmias are the most common post-operative complication of cardiac surgical procedures that require intervention or prolong hospital stay. The purpose of this review is to take a meta-analytic approach to the wealth of published data regarding the incidence, timing and outcomes of atrial tachyarrhythmias that occur after cardiac surgical procedures.